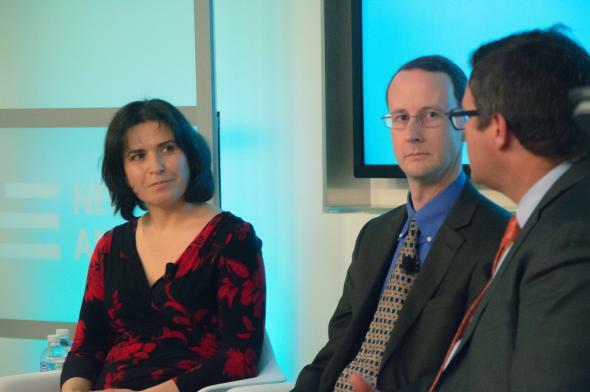 Deploying technology to rescue the past, a Future Tense event recap. Salam Al Kuntar, Scott Branting, and Kirk Johnson discuss “Deploying Technology to Rescue the Past” at New America. For centuries, museums have been the primary means through which we’ve preserved and exhibited our collective pasts. In general, we experience them as primarily physical spaces that contain mostly physical things, but technological developments are rapidly changing our understanding of what we preserve in them and how we do it. To better understand some of the ongoing changes, Future Tense convened a panel of experts on Jan. 28, 2016, at New America in Washington, D.C., to discuss the ways technology can be used to protect the past. Event moderator Sarah R. Graff, a senior faculty fellow at Arizona State University, kicked off the event by asking the panelists how technology had changed their work. Scott Branting, assistant professor of anthropology at the University of Central Florida, said that the availability of satellite data had made a significant impact on preservation projects, allowing scholars to monitor damage to sites and helping them zero in on especially imperiled regions. While they can’t always prevent crises, Salam Al Kuntar, assistant professor of anthropology at the University of Pennsylvania, said that scanning and digitization technologies have revolutionized archaeology, allowing researchers to produce digital copies of imperiled locales and artifacts. Significantly, making digital copies isn’t just about preventing thefts by looters or damage from extremist groups; it also helps to protect against the damages sometimes wrought by archaeology itself. As Branting put it, “archaeology is a fundamentally destructive science,” often tearing things apart to get a glimpse of whatever’s inside them. New technologies are making it easier to avoid even such well-meaning depredations. Al Kuntar explained that imaging systems now allow researchers to look inside objects or below the ground, helping them delve with far more accuracy than they’ve ever managed before and doing less harm to the surrounding materials in the process. With this observation, the potential dark side of archaeological preservation technologies began to reveal itself. Just as satellites and social media facilitate the discovery and protection of historically significant locations, they may also make it easier to take advantage of those sites. Indeed, the panelists noted, even calling attention to the destruction of a site can sometimes accelerate that process of ruination. Looters, for example, can monitor social media much as researchers do, looking for news of previously unnoticed locations that might contain valuable finds. In this sense, the very technologies empowering archaeology may be its undoing. For all that, the panelists agreed the benefits of new innovations largely outweigh the risks. Observing that everything “comes back to access of information,” Al Kuntar affirmed a point that Branting and Johnson also made: The real responsibility of archaeology is to educate us about humanity’s story. Building on this, Branting suggested that researchers have to trust that ordinary people will recognize the value of such work. “And hopefully that faith in humanity outweighs the risk of bad stuff,” he said. Watch the event on the New America website.